Four years ago Robert Twaddle went to his high school prom wearing a suit that made him feel “uncomfortable”. Robert has just completed another educational milestone - but the suit he wore this time, to his graduation, has had an entirely different effect. On the left is a photo of me incredibly uncomfortable at my school prom. I didn't feel like my suit was representative of who I was.I felt I had to wear it. Now 4 years later, for my graduation, I reclaim the suit. In my own way. On my own terms. The photos comparing himself from four years ago to the present day have gone viral, with tens of thousands liking his post on Twitter and hundreds offering support. “The response has been a little overwhelming,” said Robert. “I posted it on my way to a BBQ yesterday and thought nothing of it, and by the time we had arrived my phone started buzzing non-stop with mainly comments of love and support. What a great transformation, you exude confidence and style now. Hope you tore it up at your graduation and had a most fabulous time! On the suit of four years ago, Robert said: “It felt like a strict reinforcement of ideals that I didn’t agree with and I went along with it anyways. “Now don’t get me wrong, I wouldn’t have worn a dress either, I wasn’t out as a gay man, I couldn’t just flip the script and turn up cross dressed. I’d have lost my head for it! Robert was finishing a year on an actor development course called Peer Productions, and he said the outfit he wore to his graduation was a development of “what we see as masculine and feminine”. “I wanted to try and get the traditional silhouette of a suit and turn it on its head,” he said. “By swapping out some of the key components of what makes something masculine (whatever that means) I found a nice middle ground. 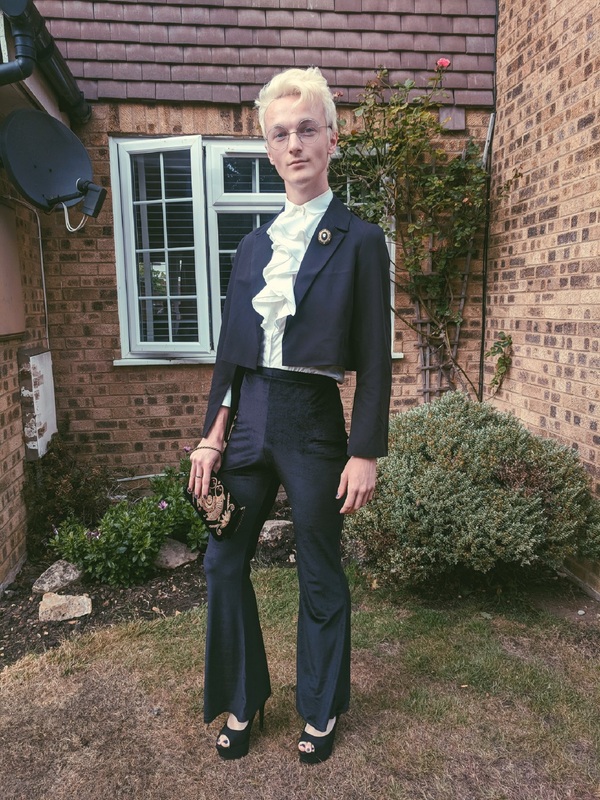 “I got a cropped blazer and a high-waisted flared trouser to give the whole thing more shape, added some ruffles, a nice clutch and a killer pair of tall black stilettos. He noted that there is “a massive gap in the market for more androgynous formal wear” as it took him “bloody ages” to find anything. Despite a largely warm reception, Robert added that some comments on Twitter were less warm-hearted. “As with anything like this there are also masses of hate messages alongside the positivity,” he said. “People saying that ‘If I was his dad, I’d disown him after this’. “The comments online aren’t anything that affect me too much. I’m used to it. Robert hopes the tweet will give some people “permission to be visible”. “The same way I do when I see a queer couple holding hands down the street, I want them to feel that they are allowed to be themselves whatever it is that that means to them,” he said. Robert has a GoFundMe page, where he hopes to raise the money to go to his dream drama school.